With the concentrated precision of poetry, VILNIUS DIARY has also the richness of a novel and the intimacy of a memoir. Memory, loss, and immigration are captured in poignant images. Each poem inhabits a dual time and space. Never simply a lament, Halberstadt weaves together the sacred and the wildly profane, lighting the great darkness with wit and laughter. Anna Halberstadt was born and raised in Vilnius, Lithuania. At the age of eighteen she moved to Moscow to study psychology at Moscow State University. She immigrated to New York twelve years later and earned a degree in social work. Since 1980, she has worked as a clinician, teacher, and administrator of mental health clinics. 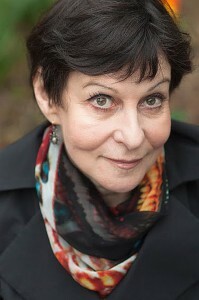 Anna has published many works in the field of psychology but has found poetry to be a more adequate and condensed way to expand on the same themes—growing up as a child of Holocaust survivors in a country still struggling with past trauma, living in three countries (Lithuania, Russia, U.S.), and immigration. Anna Halberstadt studied with Saskia Hamilton, Ariana Raynes, and Eileen Myles. Her creative work has been published by Cimarron Review, Permafrost, Mudfish, Alembic, St. Petersburg Review, Tiferet, Forge, The Good Men Project, Amarillo Bay, Crack the Spine, Bluestem, Rio Grande Review, Clouwalk, Literary Imagination, and has appeared in translation in the Lithuanian journals Literatura ir Menas and Shiaures Athenai. She was a finalist for the Mudfish Poetry Prize in 2013. She lives in New York with her husband, the artist Vitaly Komar.